Quality education is most at risk during times of conflict or crisis. The new global education agenda (Education 2030) puts strong emphasis on this reality and urges countries to implement policies and strategies to ensure that the right to a quality education is delivered no matter the circumstances. This is especially important as one in three of the 124 million out-of-school children live in a fragile or conflict-affected country. A transitional education plan, or TEP, is an important policy instrument that countries can develop to help ensure that children and youth do not miss out on their right to a quality education. 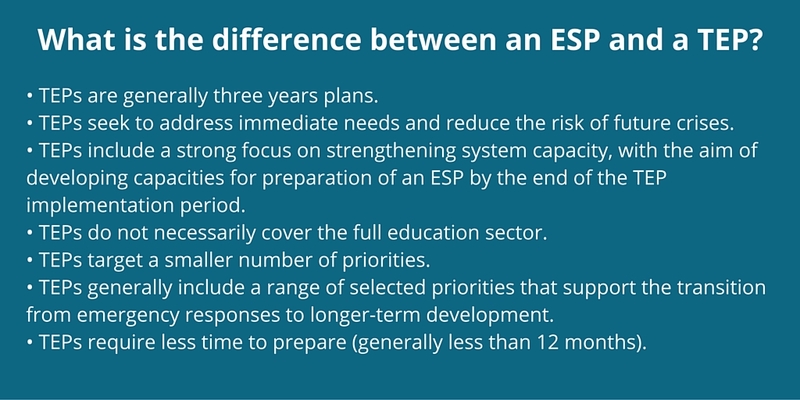 During conflict, social unrest, health emergencies or natural disaster, long-term planning or the implementation of an existing education sector plan (ESP) can often become compromised. Alternatively, a TEP can help authorities and partners develop an immediate or medium-term plan that addresses critical education needs and reduces the risk of future crises. During fast-moving or uncertain situations, a TEP can help steer and mobilize much-needed resources to maintain education. While the TEP is transitional in nature, it is also designed to help advance long-term reforms to ensure that education systems become more accountable, inclusive and effective over time. As such, a TEP intends to bring together humanitarian and development partners and bridge the humanitarian-development divide. To help guide countries in developing and implementing a TEP, IIEP and the Global Partnership for Education (GPE) have just published the Guidelines for Transitional Education Plan Preparation. The new guidelines, which can be adapted to a variety of contexts and needs, stem from extensive collaboration with a range of international partners, including those who are part of the Inter-Agency Network for Education in Emergencies. The guidelines outline essential elements of a well-developed TEP and include the key steps and helpful resources for the plan preparation process. The TEP guidelines draw heavily on the existing GPE-IIEP Guidelines for Education Sector Plan Preparation. Read more from GPE on how the TEP guidelines can help conflict-affected countries keep their children learning in school.